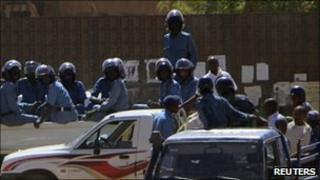 A student has died from his injuries after clashing with Sudanese police, activists say. Mohammed Abd al-Rahman was studying at Ahaliya University in Omdurman, the scene of fighting on Sunday. Police said they had no reports of a death. The anti-government protests have been inspired by those in Tunisia and Egypt and were also organised on Facebook. Separately, Sudan's vice-president has confirmed the north will accept the south's vote in favour of secession. After the results were announced on Sunday - with 99% backing independence - two weeks had been set aside for appeals. The BBC's James Copnall in Khartoum says it seems that nothing will stop southern independence in July. Vice-President Ali Osman Taha also said that the government would do more to help students and the very poorest cope with the rising cost of living. Economic hardship, along with the lack of political freedom, sparked Sunday's demonstrations in Khartoum and its twin city, Omdurman. One prominent human rights activist said Mr Rahman had been shot. "You are our martyr Mohamed Abd al-Rahman," activists wrote on a Facebook group called Youth for Change which has more than 16,000 members, reports the Reuters news agency. Khartoum's universities are said to be surrounded by heavy security and some have been closed. The police said they had not received reports of anyone being killed during the demonstration. Our reporter says the protests come at a difficult time for President Omar al-Bashir. Independence for the oil-rich south will hit both the northern economy and Mr Bashir's prestige, he says. The independence referendum was part of a deal to end decades of conflict between the north and south, which are deeply divided along ethnic, economic, religious and linguistic lines.